One of my local stores had a fantastic Fourth of July special on Niman Ranch premium, pastured, baby back ribs ($4.00 off per pound!). I am (temporarily, I hope) allergic to tomatoes and peppers and a lot of other foods, so I was seeking a way to make a good barbecue sauce with lots of flavor and kick when I came up with this one. My husband loves this even better than my old version. I may never go back, even if I can. There is no tomato in this tangy, sweet/hot, South Carolina-style barbecue sauce. Vinegar based sauces are thinner and should be applied more frequently. The sauce recipe makes enough for several batches, but it will keep for a month or two in the fridge. Try it for chicken and fish as well as ribs. Combine all ingredients in a bowl or shake together in a large jar. Cover tightly and store in the refrigerator. Sauce will keep for about 2 months. 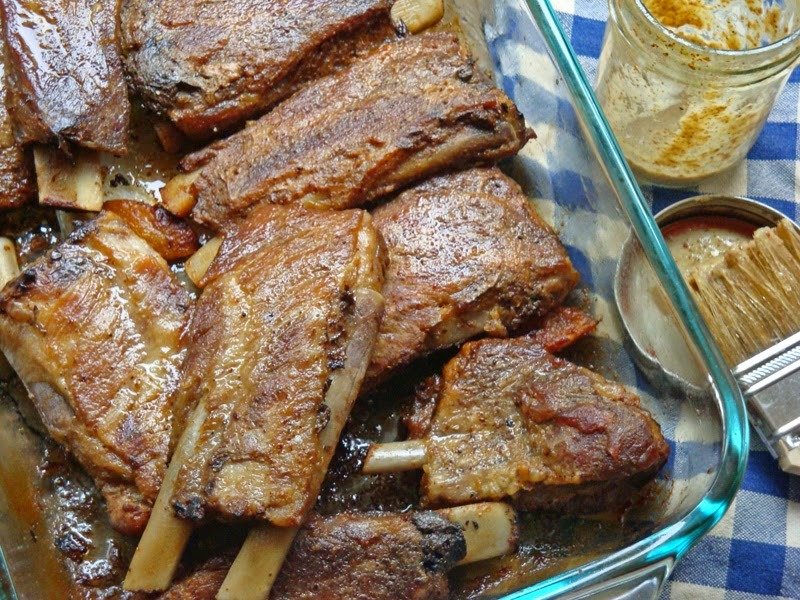 Allow 1 pound of baby back pork ribs as purchased per person. Cut the racks into two-rib portions before roasting, if desired. Sprinkle with salt and pepper and rub with olive oil. Place in a roasting pan, concave side up; cover pan tightly with aluminum foil and bake at 325º F for 2 to 2 and ½ hours or until tender. Why doesn’t pork taste as good as it used to? Modern pigs from factory farms, “the other white meat,” are much leaner than old fashioned porkers. Some producers, like Niman Ranch, raise hogs in open pastures without the use of antibiotics or growth hormones. Because the hogs live outdoors in the Midwest, they develop more fat for insulation from summer heat and winter cold, which promotes superior marbling, flavor, and tenderness. Mustard and vinegar Barbecue Suace, Pepper-free, Spare Ribs, Tomato-free. Bookmark. This was amazing! I didn’t have any maple syrup or sugar free maple syrup so I substituted 2 tablespoons of salted caramel sugar-free coffee syrup it was incredible! Thanks for sharing this recipe. And thank you for sharing your idea, MLCDz!